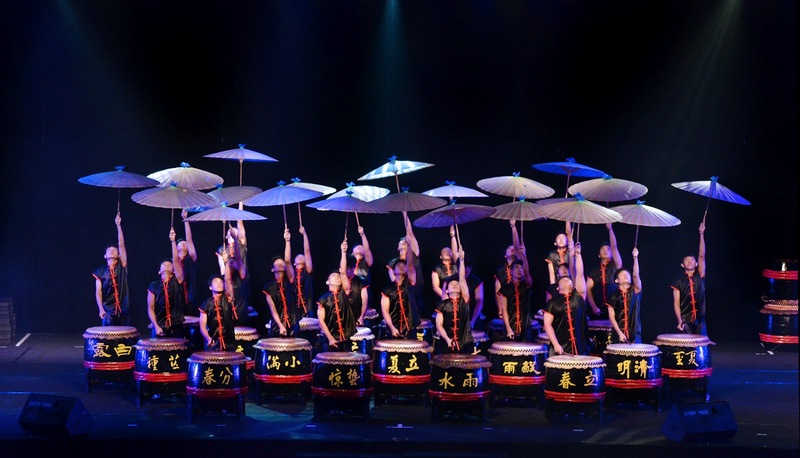 In 1988, when Tan Chai Puan and the late Tan Hooi Song founded the 24 Festive Drums in Johor Baru, they did not know that this creative art of drumming would grow into an international art-form. 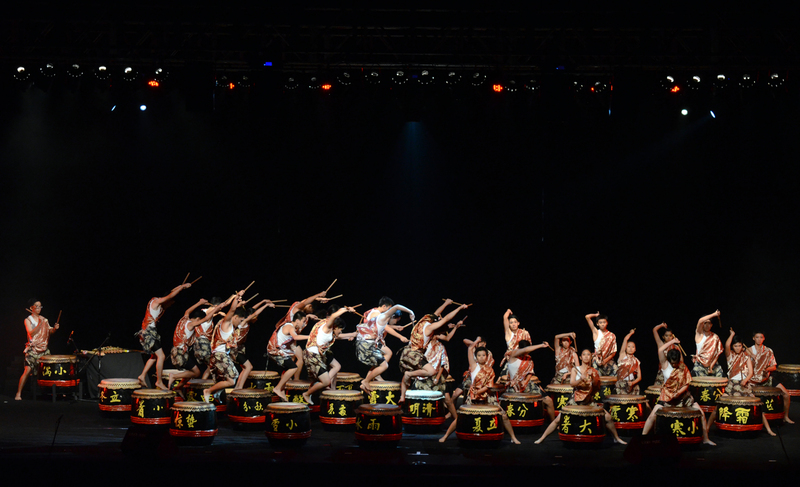 When 7 international and 6 national drum troupes came together for the 2nd International Invitation & National 24 Festive Drums Competition on Sept 15, the MBJB Indoor Stadium reverberated with the pulsating rhythms of Chinese drums. Enthusiastic fans started streaming in from as early as 5pm and the 7,000 capacity stadium was packed with people when seats were filled right up to the rafters. The 24 Festive Drums was recognised as a national cultural heritage by the Unity, Culture, Arts and Heritage Ministry on 14 February 2009 and it is a proud achievement as the drums celebrate its 24th anniversary this year. 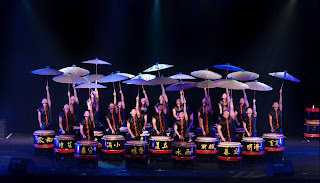 Since its inception at Johor Baru’s Foon Yew High School in 1988, this unique art of drumming has spread nationwide and abroad and was even incorporated into the cultural ceremony to pay respects to ancient Chinese national ancestors in the Hu Nan province of China. 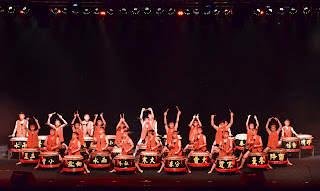 Now there are more than 300 drum troupes worldwide including professional troupes in Singapore, Taiwan, China, Thailand, Switzerland, United Kingdom and the United States. 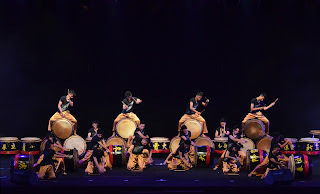 In the national competition at the event, Malaysian troupes took turns to present colourful and creative drum performances in various themes while the international troupes presented an exhibition of their skills in this Johor-born art of drumming. 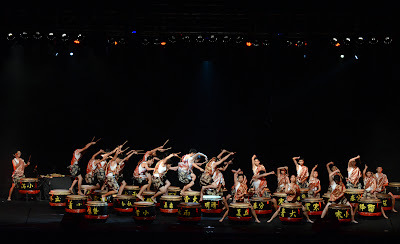 The foreign troupes at the event included the M24D troupe from the Oklahoma State University, United States of America, the University of Liverpool troupe from the United Kingdom, Hua Qiao University in China, Taiwan Xinzhuang Drum Art Team and ZingO Festival Drum Group and Edgefield Secondary School troupes from Singapore. This spectacular show was organized as part of the Johor Baru Tiong Hua Association’s 90th anniversary celebration and was an item in the calendar of the 9th Johor Baru Arts Festival. In his opening address, Lim Ik Kim, president of the Johor Baru Tiong Hua Association, expressed his pride in the 5 cultural products that are recognised as Johor attractions. Besides the 24 Festive Drums, he listed the city’s annual Chingay street procession, the Lantern Festival, the Johor Baru Chinese Heritage Museum and the Tan Hiok Nee Heritage Walk. 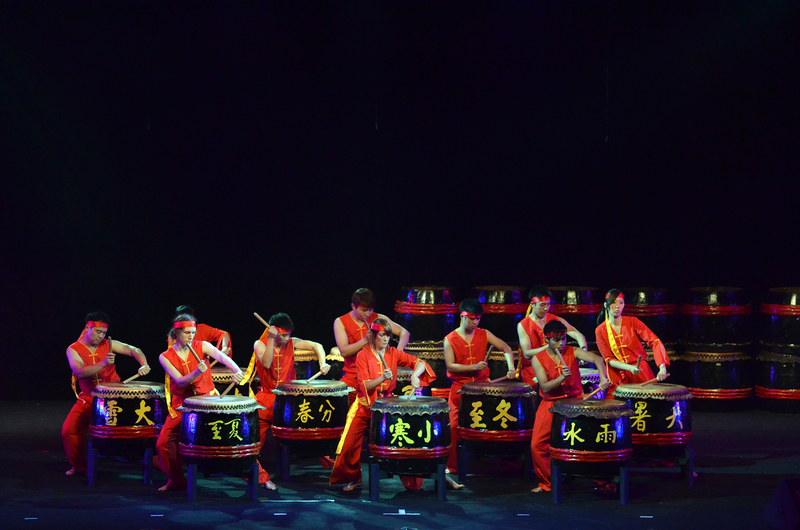 He also acknowledged the founders of the 24 Festive Drums, Tan Chai Puan and the late Tan Hooi Song, for their contribution to this creative art of drumming. JB Arts Fest patron and Member of Parliament for JB, Tan Sri Dato Shahrir Abdul Samad, congratulated the Johor Baru Tiong Hua Association for organizing this prestigious event that went a long way to promote a positive image of JB. In addition to the 5 that Lim said are Johor Baru icons, Shahrir identified 3 more cultural products that Johor should be proud of, naming Johor’s dragon dancers, the Foon Yew High School and Southern College which would soon receive its recognition as a university. He has high regard for Foon Yew High School, the institution that inspired the birth of the 24 Festive Drums which is celebrating its 100th anniversary while our nation has only marked its 55th anniversary! As the troupes added drama to the drumming, fans of the 24 Festive Drums thrilled to the superior standards of performance by school troupes in the competition segment of the event. Troupes from Foon Yew High School Johor Baru, Foon Yew High School Kulai, Chung Hua High School Seremban, SMJK Yu Hua Kajang, SMJK San Min, Teluk Intan, Perak and SMK Jalan Arang, Kuching, displayed exciting choreography while some used additional percussion instruments like cymbals and even props like long bamboo poles and umbrellas. 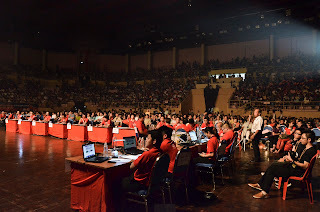 The brilliant blend of colourful costumes, clever choreography and creative drumming presented the audience with an entertaining evening while the panel of judges probably had a tough time in awarding scores after watching each impressive performance. After the scores were tallied, the special awards for Best Creation, Best Technical Performance, Best Formation and Best Composition, were all swept up by SMJK Yu Hua, Kajang for their rendition of “The Crying of the Crowd,” a theme inspired by rapid development that caused global warming and the critical damage to our delicate eco-system. 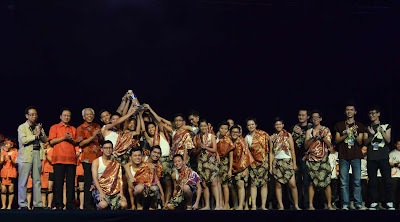 The Bronze award went to SMK Jalan Arang, Kuching, whose drumming performance entitled, “The Passion of Borneo,” included elegant ethnic dance steps that are unique to their state. 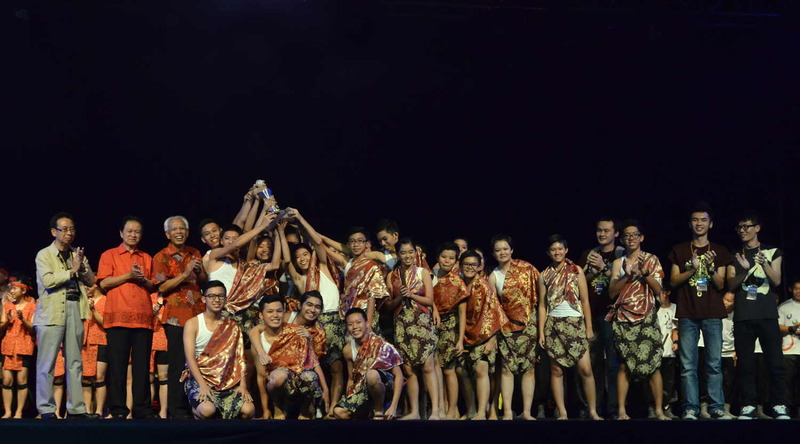 The commendable performance by Foon Yew High School Johor Baru entitled, “Chuan Deng – Passing on the Lamp” earned the troupe the Silver award while SMJK Yu Hua, Kajang won the Gold and emerged as the event champion. 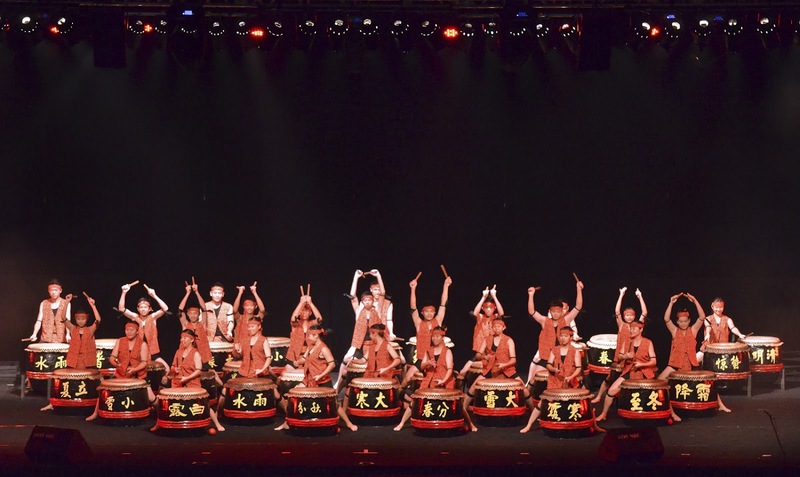 “I plan to write a book about the 24 Festive Drums and establish an international platform for global communication among drumming enthusiasts,” said Tan as he reflected on the success of the event. With overwhelming response from the public and the positive feedback from first-time viewers, Tan is pleased that the reputation of the 24 Festive Drums is now firmly established and ready to be further developed into a strong cultural product. 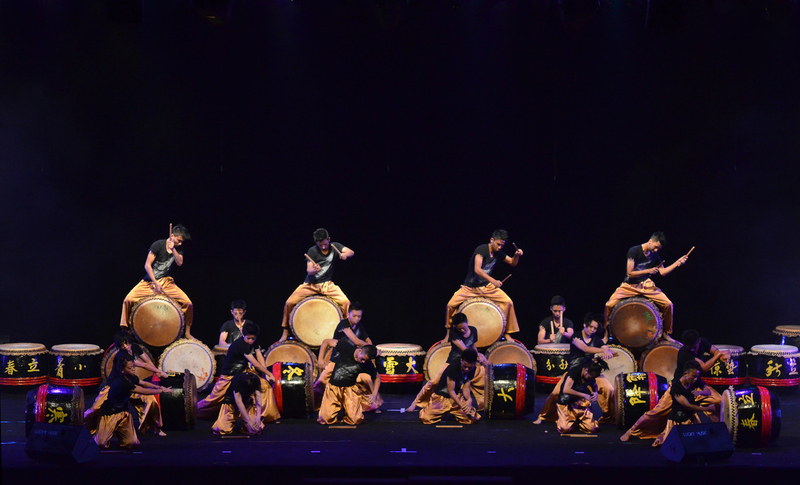 “A friend of mine commented that this art of drumming is bringing nationalities from all parts of the world together to one common platform – their passion for the 24 Festive Drums,” said Tan. Wei Yen Chen, widow of the late Tan Hooi Song commented that this performing art that involves much creativity, imagination, strong team discipline and tough training, is very good for the development of youths, particularly in character building. Two friends, who saw this dramatic drumming show “live” for the first time, succinctly summed up the sentiments of the entire audience. “So much practice went into presenting such well synchronised and entertaining performances. These drummers are truly in a class of their own!” said Florence Liew, praising the drummers for their skills and commitment to the art while Emily Linggam said that troupes like SMJK Yu Hua Kajang and SMJK San Min, Teluk Intan, succeeded in drawing them into the stories they were telling. “It was an eye-opener for me and to discover that the 24 Festive Drums originated in Johor Baru – I’m so proud to be a Johorean!” said added. 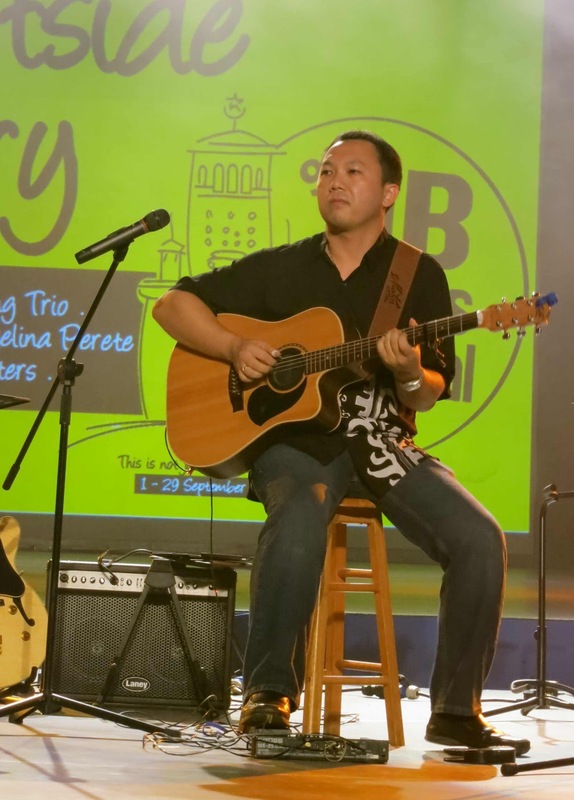 Fans of the Johor Baru Arts Festival are familiar with Roger Wang as he has been featured not only in several of the JB Arts Festivals but also as one half of Double Take who performed in the MyKasih Foundation fund-raising show in Johor Baru recently. Sabah-born Wang is widely regarded as one of Malaysia’s most gifted solo acoustic guitarists with seven highly acclaimed albums. 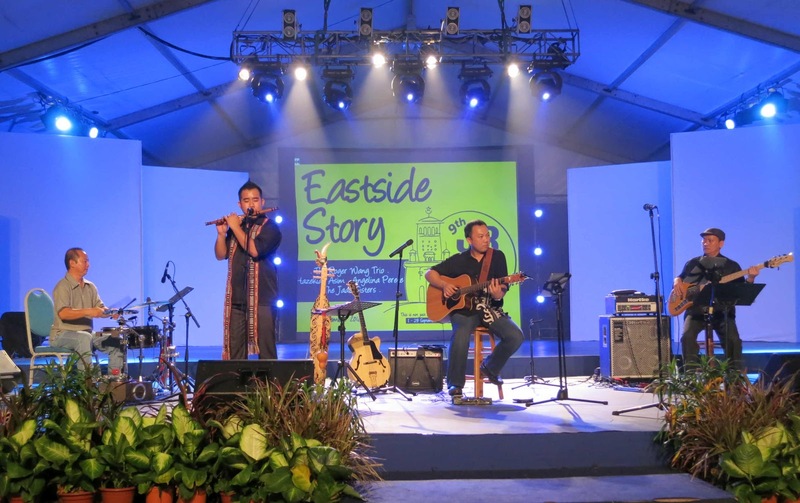 When he was invited to perform in the 9th JB Arts Fest, he did better than just say, “Yes” because he also invited a few friends from East Malaysia to perform with him in a musical showcase entitled, Eastside Story. On Sept 21, Roger Wang fans had a special treat in watching him perform again “live” as the Roger Wang Trio with Simon Lau on bass guitar and Peter Lau on drums. The breezy feel of Wang’s acoustic melodies, recognised as stylistically his own, kept feet tapping and heads bopping to the lively rhythm. Instrumental music lovers listened with bated breath, impressed with how his skillful fingers moved swiftly through the chords. 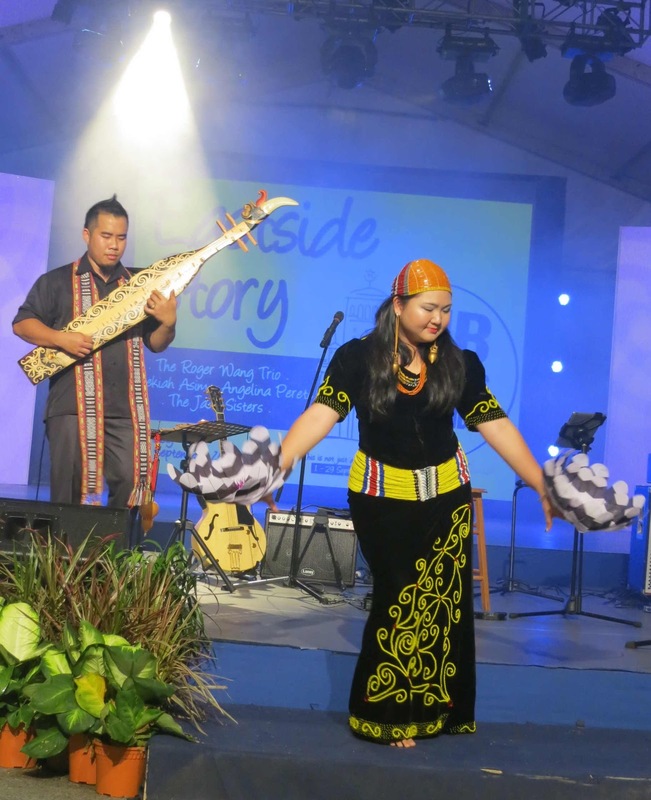 Wang’s talent was recognised in 2007 when he was voted Sabah Outstanding Young Person of the Year in the category of Cultural & Artistic Achievements by JCI Kota Kinabalu. He has performed in shows throughout Malaysia as well as abroad in Singapore, Taiwan, Japan, the Netherlands and the United States of America and recently had a sold-out concert as Double Take with Mia Palencia at the prestigious Petronas Philharmonic Hall. His composition, “Love Scale” gained worldwide popularity when Hong Kong superstar, Jacky Cheung, recorded a Cantonese version and won the coveted Top Ten Original Songs (International) and Best Overseas Interpretation Artist awards for Cheung. At the Eastside Story showcase, Wang introduced Hezekiah Asim, a renowned Sarawakian multi-instrumentalist, who wowed the audience with his skills in playing several traditional ethnic musical instruments like flutes, the sompoton (Borneo mouth organ) and sape (Borneo lute). Asim proved to be a versatile musician, equally skilled in wind and stringed instruments, as he collaborated with modern musical instruments of the Roger Wang Trio in several pieces like, Save our Rainforests and Sape Paradise. “I feel at home while I’m in JB,” said Asim when he overheard people speaking in Hokkien and explained that he is half-Hokkien Chinese. He played a traditional Chinese wind instrument called a hulusi that has a gourd shape body joined to a short bamboo pipe and received loud applause when the audience recognised the tune made popular by the Wong Fei Hoong movie. Then as he played traditional ethnic music on the sape, his wife gracefully performed the Datun Julud, a traditional dance of the Kenyah tribe. The vocalists in Eastside Story were the Jade Sisters from Tamparuli, Sabah – Joan, Amy, Didi and Erika – but even though Erika could not come due to school exams, the guitar and ukulele-playing quartet-minus-one still presented beautiful vocal harmony in their own compositions, “Hot Chocolate”, “Alone in Seoul” and “Eggnog”. Backed by the Roger Wang Trio, Angelina Perete enthralled the audience with her husky vocals as she performed popular jazz standards and “Butterfly Baby” a song she wrote for her children that debuted at number one on Hitz.fm’s Borneo English Chart Show in May 2011. 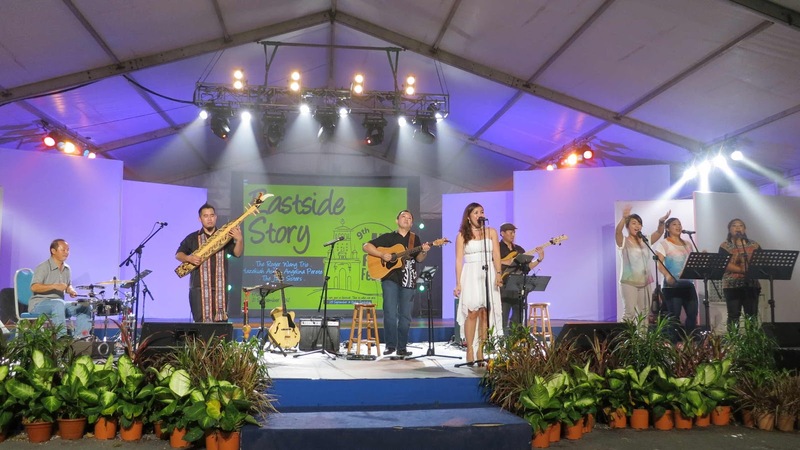 A showcase like the Eastside Story was an excellent platform to give the audience a glimpse of the talents and wealth of traditional music heritage in East Malaysia. ﻿﻿﻿﻿﻿﻿﻿﻿Ramli Ibrahim, cultural icon, artistic director of the Sutra Dance Theatre and chairman of Sutra Foundation, really needs no introduction. This award-winning dance virtuoso single-handedly established Odissi an ancient Indian dance, as a widely appreciated art-form and transformed the dance scenario in Malaysia in the last 3 decades. So when the Johor Department of Culture and Arts organized a special showcase of “Vision of Forever” featuring Ramli Ibrahim in Johor Baru on Sept 14, all the tickets to the free-show were snapped up almost immediately. 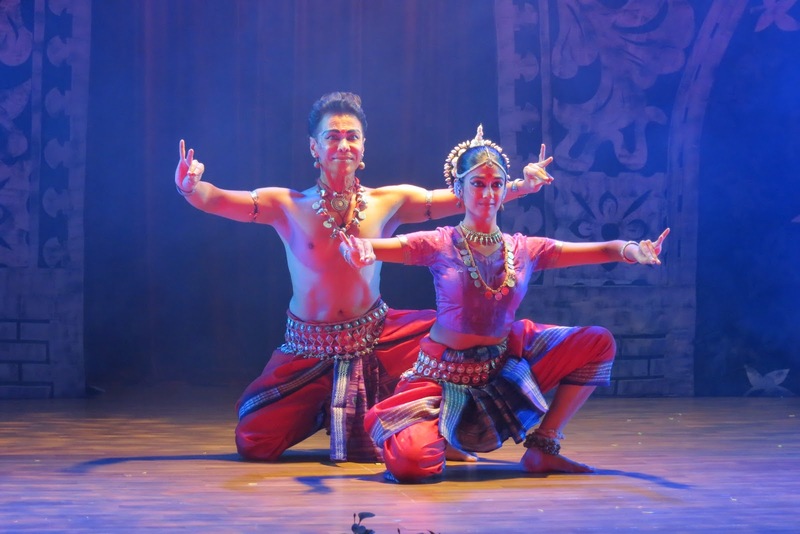 For almost two hours, Ramli and the Sutra dancers, also featuring award-winning Guna, and lead female dancer, Geethika Shree, captivated the audience’s imagination and transported them to another realm to feel emotions as varied as love, joy, peace, anger, wonder, sadness and even fear. 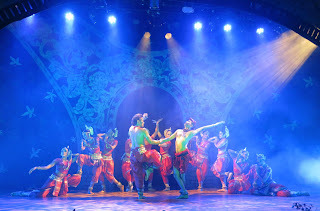 In Vision of Forever, Ramli’s choreography brought out macabre and terrifying beauty in powerful images from Shaivite and Tantric traditions that were complemented with award-winning lighting and set design by Sivarajah Natarajan. From the opening strains of the raga, the audience was held spellbound by the melodic tunes of Indian classical music and the rhythm of ankle bells as they enjoyed the grace and beauty of odissi with elaborate body postures, intricate footwork, facial expressions and interesting eye movements. 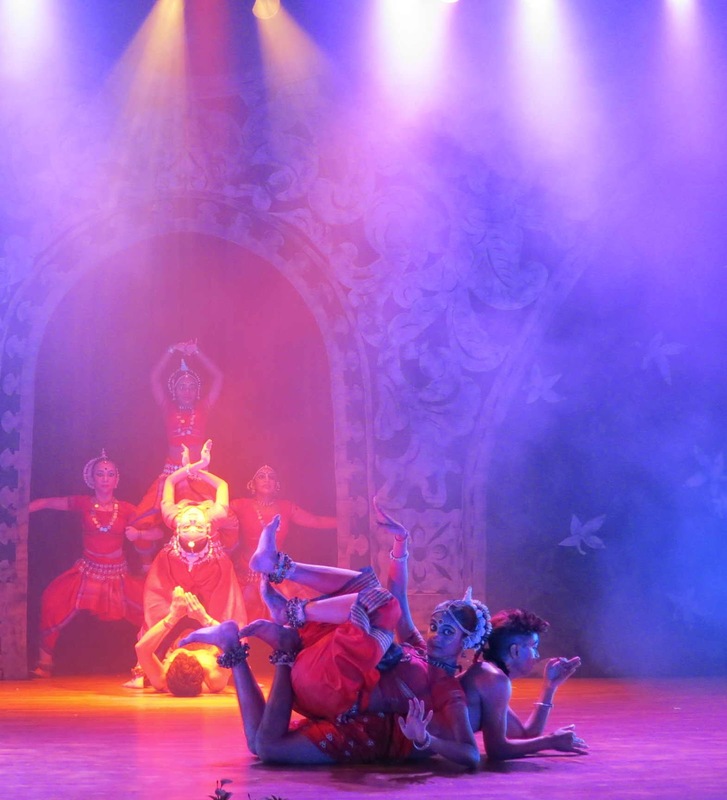 When Vision of Forever premiered at Kalakshetra, the bastion of Indian classical dance in Chennai, India, in December 2006, it received tremendous reception and the show continued with a tour in Southern India in 2007. Sutra later performed this spectacular show in Delhi, Jaipur, Mumbai, Coimbatore and Bangalore. 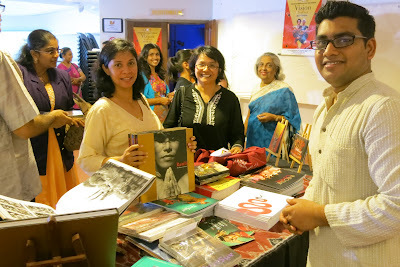 In July 2011, Sutra had a successful season at the Indore Odissi Festival and Baroda, National Centre for Performing Arts, Mumbai and created history by performing Vision of Forever in the Wall Street Financial District of New York in September 2011.
the background, Sthai - the temple sculptures come to life! The Mangala Charanam performed by Ramli and Geethika Shree, started with slow, graceful and poetic movements of the eyes, neck, torso and feet that gradually built up to a crescendo. They depicted two celestial dancers who descended from their heavenly home to dance for the gods and mortals. Ramli and Geethika moved with such grace in synchronicity and symmetry that it was easy to connect with their emotions as they told their story with a series of refined movements of the eyes, feet and hands. 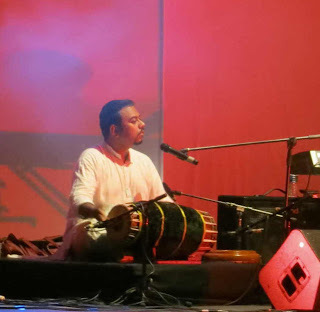 In the performance of Dasamahavidhya the audience was thrilled by Guna, renowned as the first Malaysian male graduate from Kalakshetra and one of the nation’s most evocative performers in Indian classical dance. 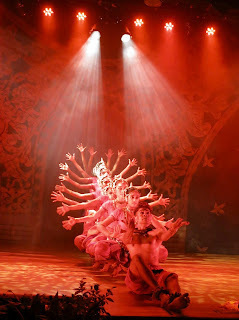 Guna performed as the principal dancer with 10 female dancers who depicted the 10 forms of Shakti (the female energy) represented by goddesses that were dramatically introduced by their characteristics. Each of the Sutra dancers beautifully personified the devis, Kali, Tara, Bhuvaneshvari, Sodasi, Bagalamukhi, Chinnamasta, Mathangi, Bhairavi, Kamala and Dhumavathi, who are believed to be the epitome of creation. While the intricate group compositions arranged by Ramli in his inimitable style invested Vision of Forever with elegant and stunning visuals, the odissi dancers’ costumes, jewelry and accessories are also a delight to the eyes. Female dancers were adorned by silver bell ear-rings, bracelets, armlets, necklaces, wide belt and an elaborately ornamented head-piece. It was interesting how the dancers skillfully moved comfortably and gracefully in the costumes that were draped around the body in the traditional way. 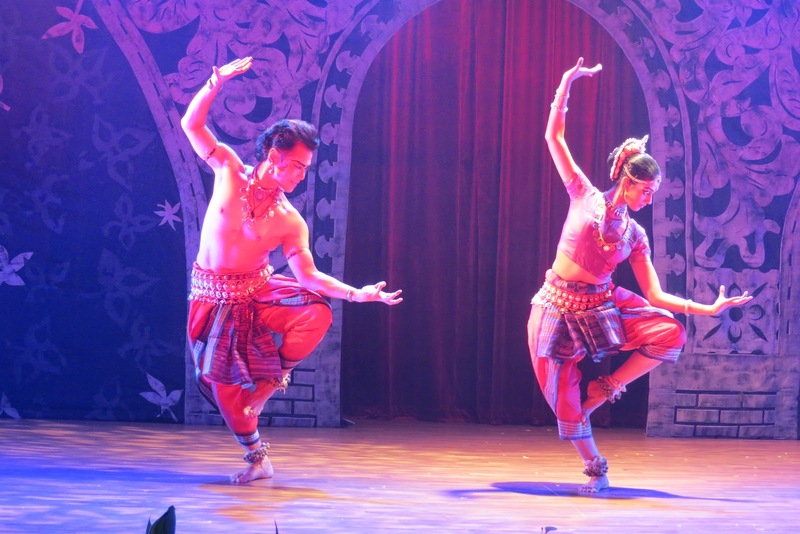 Among Sutra’s talented dancers are multi-racial dancers of Indian, Malay, Chinese and mixed parentage. Ten female dancers who performed in Johor Baru with Ramli and Guna included principal dancers Geethika Shree, Nishah Devi, Tan Mei Mei and Michelle Chang. At the end of the show, Hjh Asiah Md Ariff, Johor state Chairman of Rural and Regional Development, Arts, Culture and Heritage presented Ramli and the Sutra dancers with souvenirs. After the dancers took their final bow, members of the audience took the opportunity to meet the dancers and get a photo memento. Many were effusive with their comments and could not stop saying, “Syabas!” to Ramli and the Sutra dancers for bringing world class cultural entertainment to Johor Baru. Dr S Sivamoorthy said, “A homegrown maestro par excellence – a personality that perfectly embodies the spirit of 1Malaysia,” and praised Ramli for his borderless friendship. “A very vibrant performance and excellent lighting: It was almost like the goddess herself had descended in her many forms,” said Suseela Arulananthem. A group made up of R. Rajendran, V. Sivadass, Jayashree and S. Shamini, unanimously agreed that it was a remarkable show and their artistic talents deserved a standing ovation. Soraya Gilmour declared that with such perfect presentation of dance, music and choreography, it was the best show of the year! “Ramli lives up to his reputation with superb choreography, stage direction and flawless performance, not to mention fabulous costumes. No wonder his fastidious eye for detail has won him international accolades,” said Nooraini Dato’ Mohd Yasin who along with her 3 daughters, enjoyed the show tremendously. Like them, many in the audience were enraptured by Vision of Forever and confessed that for a while, they forgot that they were in Johor Baru. They agreed that Ramli is indeed Malaysia’s dance icon and longed for the opportunity to see him perform here again. For more info about cultural events organised by the Johor Department of Culture and Arts, Tel: 607 – 224 8270, 223 1249 or Fax: 607 – 223 9413. In old Johor Baru, there once was a Chinese herb shop named Thye Hoe Tong Medical Hall located at the corner of Jalan Wong Ah Fook and Jalan Siu Nam. It is no exists but I still remember going there with my mum or grandma and being enveloped by a distinct cloud of herby smells. 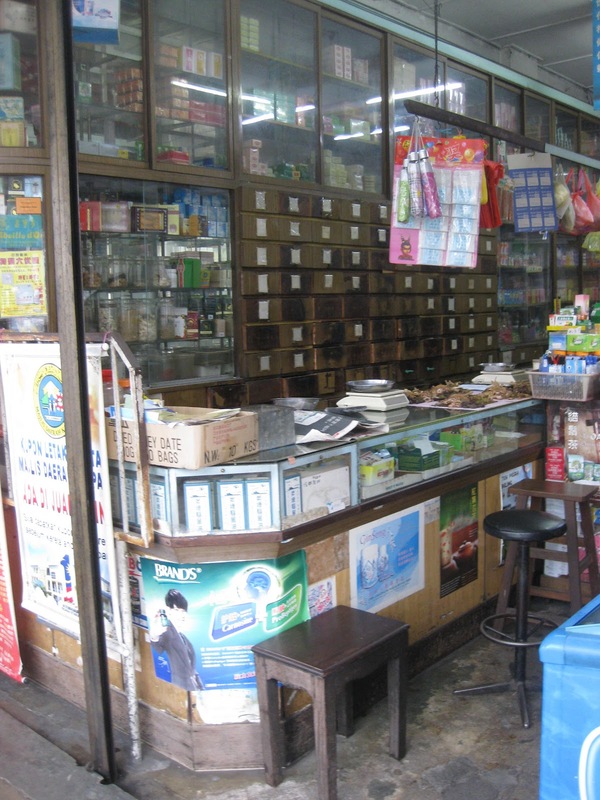 Even though traditional herb shops have Chinese origins, they have been serving the medicinal needs people of all races in Malaysia for generations. My grandma, a firm believer in herbal tonics, knew that “Prevention is better than cure,” and used to slow-boil herbal soups for us regularly to build up our resistance against any health attacks. 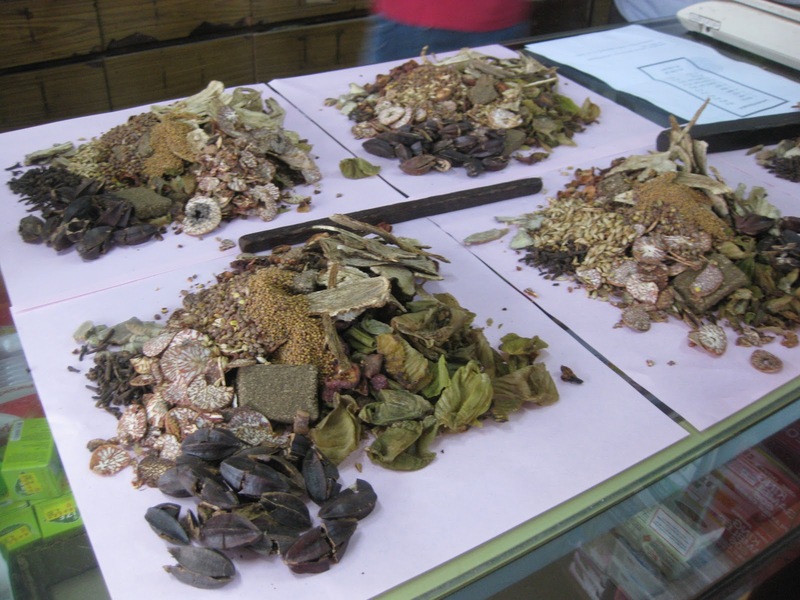 I am no expert in the benefits of Chinese herbs but I know that they have long-term positive effects on health if the right herbs are consumed regularly. Grandma has handed down a few tried and trusted herbal recipes that my mum and aunts are still using to fortify general health and I’m also convinced that the absence of any serious illnesses in my 100-year old grandma may be attributed to her conscious consumption of herbs throughout her long and eventful life! Most Asians are brought up with traditional ideas on the Yin-Yang balance and “cool” and “heaty” conditions of the human body but for the uninitiated, these concepts are far too challenging to grasp or explain. One of the simplest equations is after eating too much “heaty” foods, the body will need some herbs to “cool” down and regain its harmony and balance or risk falling ill. Instead of just drinking plenty of water, an herbal tonic concoction will do wonders for the general well-being of a heated body! One of the most unforgettable images I have of traditional herb shops are the shocking sight of dried creatures stored in the glass showcase of the counter. Unfortunately my kiddy-height bought these objects almost directly to eye level and I would shudder and avert my eyes from the remains of ugly geckcos, seahorses and snakes! These shops usually stock a range of liquor and I cannot forget the bottles of wines not just with roots soaking in them but some with snakes that purportedly are of great medicinal value! Even though old herb shops are fast disappearing, Traditional Chinese Medicine (TCM) is here to stay as established TCM brands are modernized with re-branding and marketing campaigns to match a new generation of consumers. 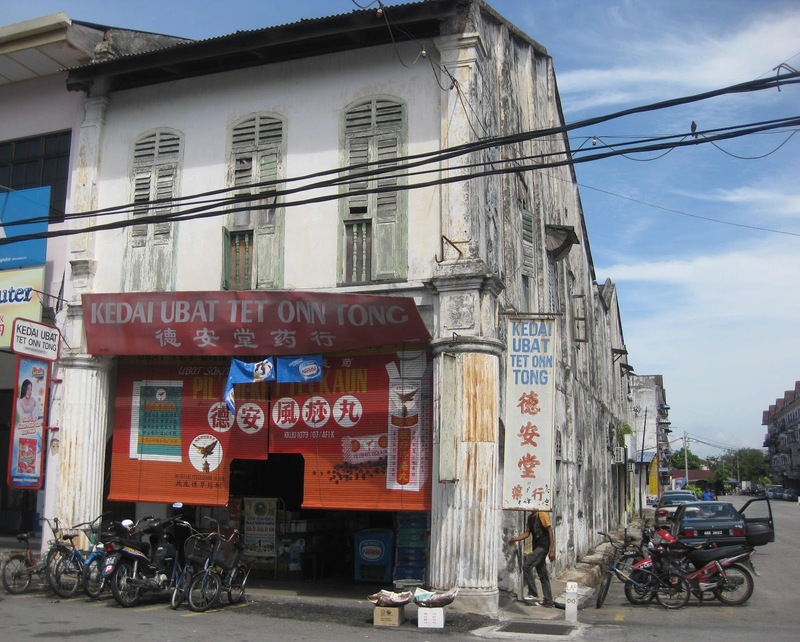 While there are still many herb shops in modern malls and suburban townships here, I was fascinated by a traditional herb shop in Kampar, Perak, that is doing business just like they used to generations ago. 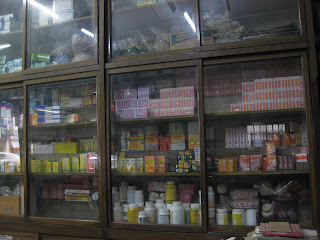 I thought its sagging signboard and ancient floor-to-ceiling shelves and drawers seem to reinforce its credibility as a trusted destination for health remedies! I paused to watch as two young ladies assembled an herbal recipe by referring to a menu and heaped little piles of herbal ingredients onto pink squares of paper that are traditionally used to wrap dried herbs for customers. 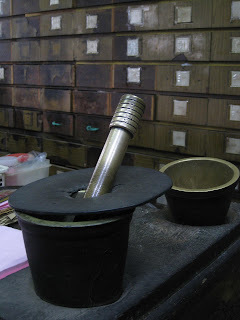 One of the ladies weighed some herbs with a little brass hand-held weighing scale before adding the ingredients to the piles laid out on the counter. My guess was that the carefully measured portions of herbs on each of the four squares of paper are prescribed to be taken four times for the best results. In olden days, the herbalist was usually an elderly man dressed neatly in a white cotton collar-less Pagoda singlet teamed with tailored trousers, skilled in giving advice and prescriptions for ailments. It is interesting to see a younger generation of herbalists taking over now and serving customers, very much in the same way, recommending remedies to help alleviate ailments. These herbalists also often double-up as sinseh or traditional Chinese physicians to give health consultations and prescriptions to patients. I distinctly remember a sinseh, reputed for being so accurate with his diagnosis that he used to receive a steady stream of patients at the back of his provision shop located along Jalan Ngee Heng, adjacent to our grandfather’s old house at No.154. He would rest the patient’s wrist on a tiny pillow to check his pulse, examine his tongue and advice against taboo food or drinks during his treatment. 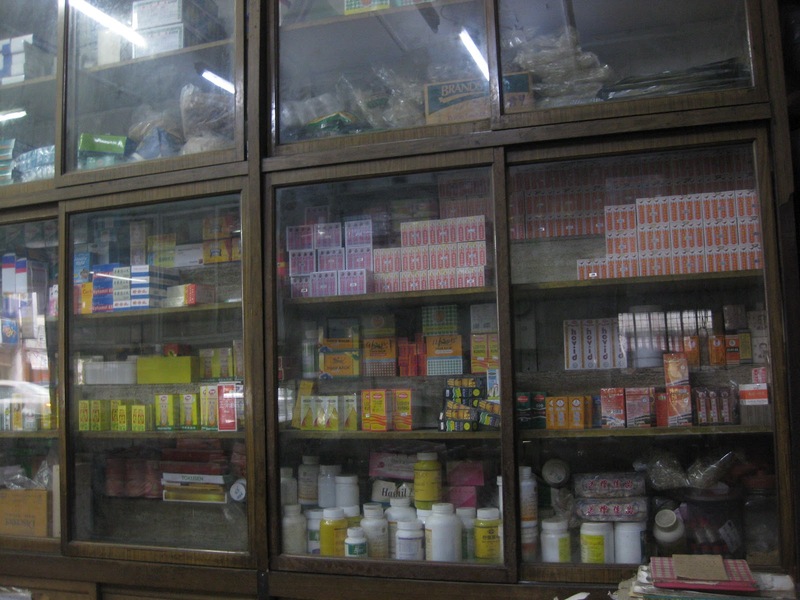 His usual method was to diagnose and write an herbal prescription for the patient to buy from an herb shop to boil and drink the brew according to his instructions. With a tradition of drinking slow-boiled soups at home, I enjoy delicious and fortifying herbal soups brewed in meat stock but drinking herbal tonics, however, is a totally different experience. I remember how mum would have a sweet or sour-plum ready for me to pop into my mouth right after I pinched my nose and quickly swallowed the evil-smelling, bitter potion! I know now that what mum said is true but at that time, I could not be convinced that such a horrid tasting herbal potion could do me any good! Now even non-Chinese are aware that the habit of maintaining general health with alternative methods like TCM could keep the causes of common ailments at bay. In fact, alternative medicine is getting popular as a new generation of TCM practitioners is hygienically producing their prescriptions in convenient capsules, powder and brew sachets. 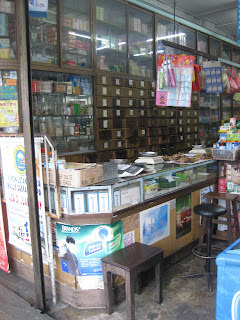 As more people discover the holistic nature of TCM, herb shops are earning a permanent place in our modern lifestyle. In Japan, we live in Shizuoka City near Mount Fuji and as the winters are extremely cold for my 90-year old mother, I wanted her to live in milder weather. I used to work with a global company with branches in Singapore and Thailand and lived in the United States for 5 years and 3 years in Belgium and was looking for a place to retire. 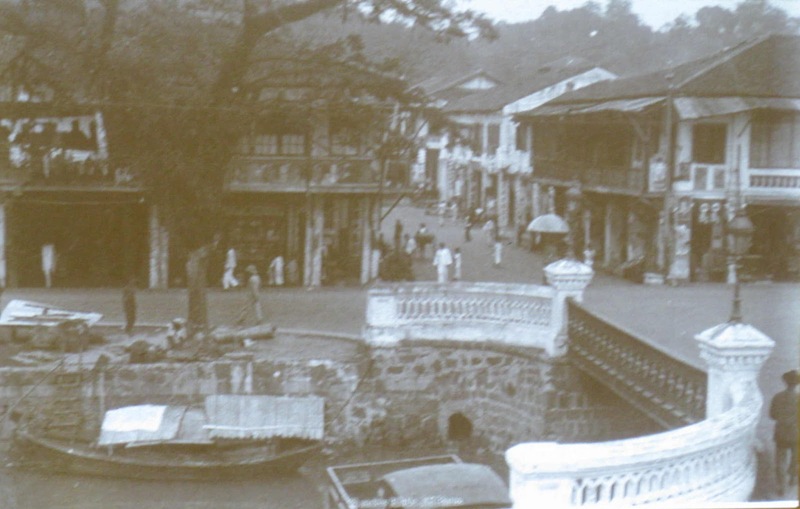 When I visited Malacca for the first time in 2008, I fell in love with Malaysia and came back again three times in 2009 with my wife to survey the hospitals and supporting amenities here. We have lived in Johor Baru since 2010 and I remember when my mother had a fall in the park during her walk in October 2011 and needed stitches above her right eyebrow. My mother does not understand English but she was treated so well in the hospital that we are reassured of the healthcare services here. 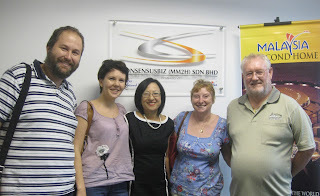 We are enjoying our Malaysian retirement and as I’m also bi-lingual in Japanese and English, I hope to share my experience to help other Japanese who may need advice on their relocation to Malaysia. We are from Aberdeen, Scotland, where there are hills, heather and sheep but the weather is just too cold there. So when my wife, Margaret, saw the hills and greenery as she stepped off the aircraft on her first visit to Langkawi, she knew that this is where we will retire. The terrain in Langkawi is similar to our homeland but the weather here is just right because even if it rained, we will have warm rain! We are based in Singapore for my work and as we have fallen in love with Asia, we decided to make Malaysia our second home. 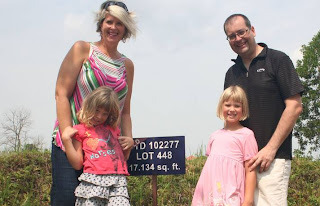 We often drive through Johor Baru to explore Malaysia for golf and spend weekends in Langkawi so it didn’t take long for us to decide on buying a property situated 2 km from the mountains and 20 meters from the sea, with the golf course just around the corner. At the moment, we spend weekends there to oversee the renovation work but we are so looking forward to retiring in sunny Langkawi. 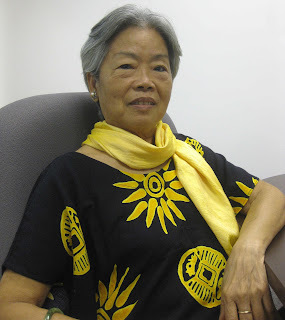 I was born in Batu Pahat, Johor and moved to Singapore in 1957 to start training as a student nurse. I married Bruce MacRae Smith, a Scots man who was then working in Singapore and we used to live in Europe for about four months a year. In 1980 when our son was 12 years old, we decided to relocate to France. My husband had bought a 35-acre property in Lot Etgaronne and turned it into a resort we called, Guirot Bas, which was very popular with families mainly in the summer. 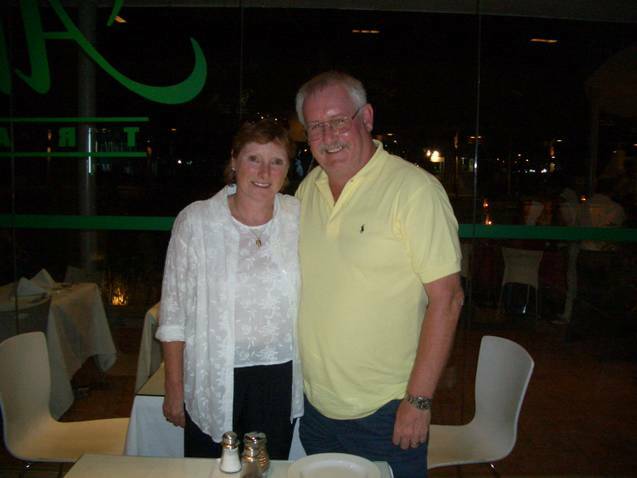 After my husband passed away four years ago, I sold Guirot Bas and came to Malaysia for a holiday in October 2010. Just a week into the holiday, I suffered a peritonitis attack and needed a colostomy. 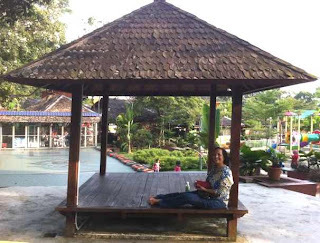 While recuperating in the hospital, I decided to retire in Malaysia and recently moved to live in a care home in Kulaijaya where I’m enjoying a carefree lifestyle especially after running a holiday resort for the last 20 years! 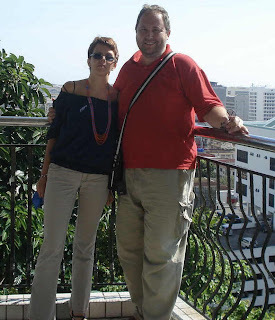 I’m Russian and my German wife, Helena, and I have always desired to live in Asia and we have lived in Johor Baru since February 2012. We chose Johor Baru because it has the best of both worlds – Malaysia’s natural charm next to cosmopolitan Singapore which has a cultural hub. We have a rich cultural history in the Soviet Union and Helena, who is a performing pianist, is able to enjoy recitals by International artistes across the Causeway. We are impressed with the efficient postal services and local parcels are even traceable online. I remember trying to send a parcel from Putrajaya and as post offices do not supply boxes, we went to the nearest mall to get one and were surprised when a shop assistant gave us a box free-of-charge. Recently at the Immigration counter at the Causeway checkpoint, I noticed a poster that promised Service-with-a-Smile and as we were about to leave, I told the officer, “You forgot to do something.” He was rather taken aback until I reminded him that he didn’t smile! Thanks to MM2H, we are living happily in Malaysia with our daughters, Maya and Lucy. I’m American married to Sven, a German, and after living in Hong Kong, Bangkok and Singapore, I often wondered where my family would continue to live. After a Chinese friend took us to visit Nusajaya, I did some research on the development in this area and it began to be crystal clear that this is where we will settle down. We attended the Open Day at Malborough College and was blown away by its new 92-acre campus, financing and educational approach. Then we found freehold residential land in this area that could be purchased by foreigners at a reasonable price. 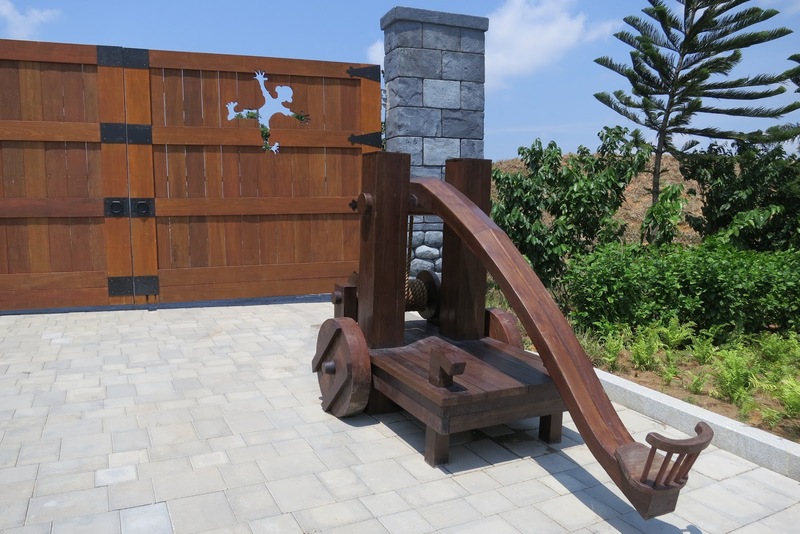 After receiving our MM2H visa, we began building our dream home, enrolled our girls with Malborough College, bought a tax-free car and hired a domestic helper and driver. 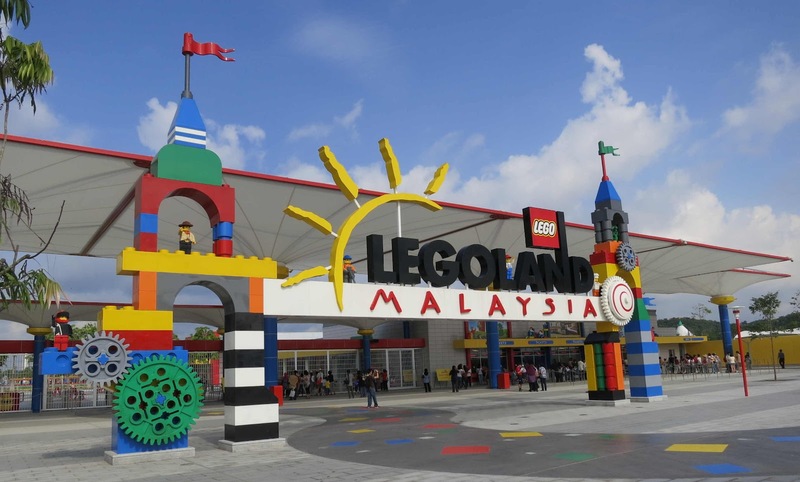 We are now enjoying being a little more part of Malaysia – truly Asia! 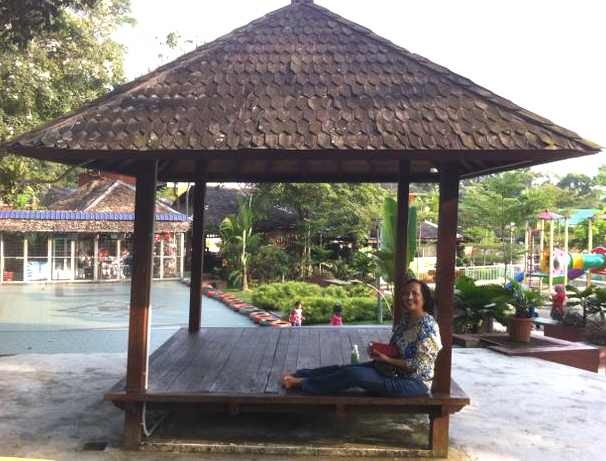 My husband and I have holidayed in Malaysia, usually passing Johor Baru en route to Kuala Lumpur, but we chose to live in JB because it is less crowded and is bordered by the sea with Singapore just across the Causeway. Our older children are in the United States and my husband often travels for business. Since our teenage son goes to school in Singapore, it is ideal for us to move to live nearer to him. Five years ago, Daisy Danker a mother of three, left a career in banking to head up the MM2H section of the business. Over a period of 12 months, Danker worked extensively in partnership with the Johor State Government and Iskandar Investment Bhd, being involved with brainstorming sessions and working in tandem with Iskandar Investment and the Ministry of Tourism to promote Johor through presentations to foreign investors. Besides meeting foreign groups here, she also joined the team for road shows to promote MM2H with investors in Singapore, Dubai, Abu Dhabi and China. Early on Sept 1, I stood in the queue, patiently inching my way through the thick crowd to the ticket window. It was a Private Event for the media but I saw groups and families trickling in after 10am, probably the media’s families and guests, joining the throng in front of the bank of ticket windows. Several young ladies standing in the queue behind me were curious about the park brochure in my hand and asked to borrow it for a peek before they entered the spanking new Legoland Malaysia theme-park in Nusajaya. 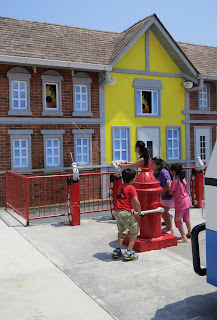 As they pored over it, I couldn’t help overhearing their discussion in strategizing on how they should start in an anti-clockwise direction so that they can dry off from the possibly-getting-wet rides before they reached the next attraction. I politely interrupted, informing them that there are Body Dryers provided for use at a small fee and they seemed rather impressed by my knowledge of the park. Rather than taking credit for being such a know-all, I confessed that I just read the info from the brochure! By this time, they also spotted my press-card that I held ready for presentation at the ticket window because identification was required to get my admission ticket. This started a friendly chit-chat with these ladies from Starhub Media, Singapore about my work and Legoland Malaysia’s much anticipated opening to the public on Sept 15. Our lively banter made the wait easier and one of them even warned the others in jest, to be careful of what they said because I was listening! 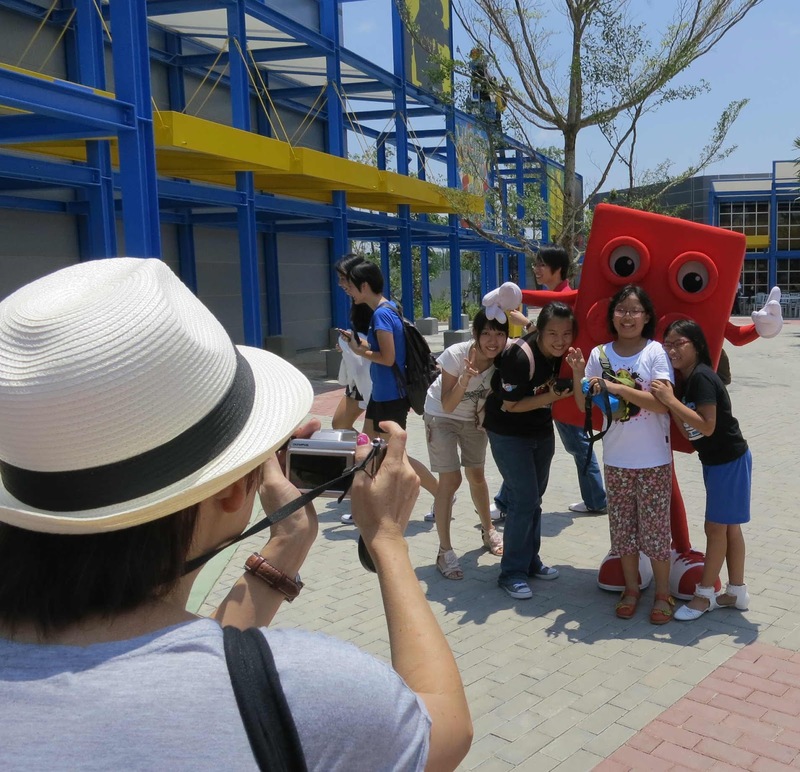 Looking at the gathering crowd, I spied photographers armed with tripods and cameras among the sea of people waiting at the park entrance, proving that there is much interest in the first Legoland park in Asia by a host of local and international media representatives. It struck me that I was standing on this site to witness the ground-breaking ceremony before the start of construction, officiated by Dato’ Abdul Ghani Othman, the Johor Menteri Besar on 2 December 2009. And I’m here again now to see that the park is open and ready to welcome visitors. 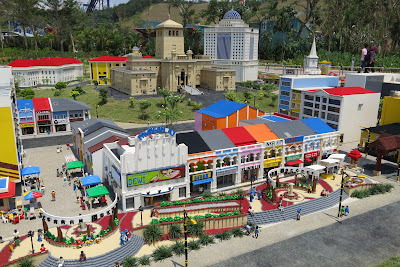 In my report on the ground-breaking event in 2009, I said that “Legoland Malaysia is one step closer to becoming a reality” and as I stood in the queue, I realized that it is indeed a reality now! 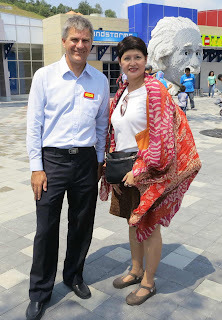 ﻿Looking back to that similar sunny day in 2009, I remember picking my way across an expanse of dusty red earth to join the media group seated under several tents pitched on a spot in the 76-acre site of Medini North in Iskandar Malaysia. The event organizer had arranged a gimmick where the Johor chief minister would shift a lever in a hydraulic excavator to tip its bucket filled with thousands of multi-coloured Lego bricks. 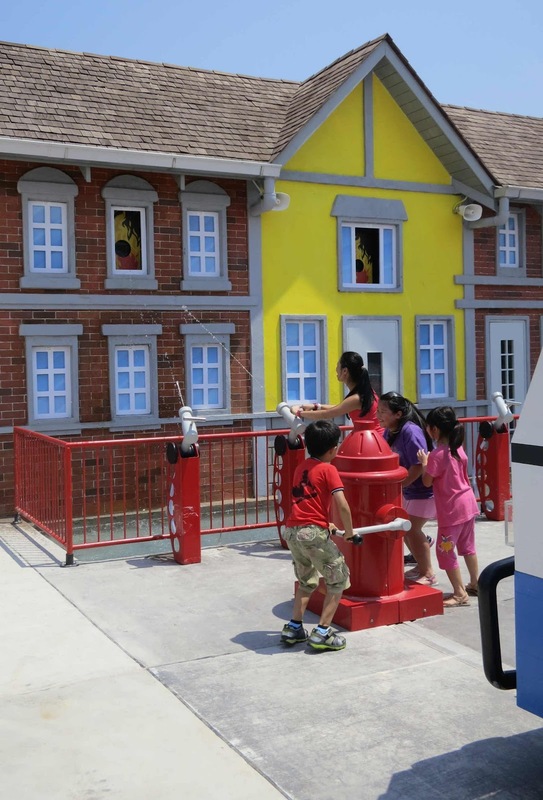 This gesture of tipping a gigantic mound of colourful Lego bricks to the ground with a loud crash marked the start of construction that turned a vision into a tangible reality! 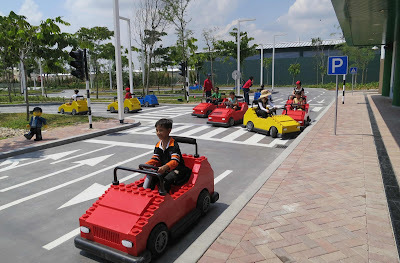 The souvenir item I received from the ground-breaking event – aptly a bagful of Lego bricks – was given to my young nephew to add to his Lego collection. I can recall how proud he was to create a unique double-propeller plane from these bricks. 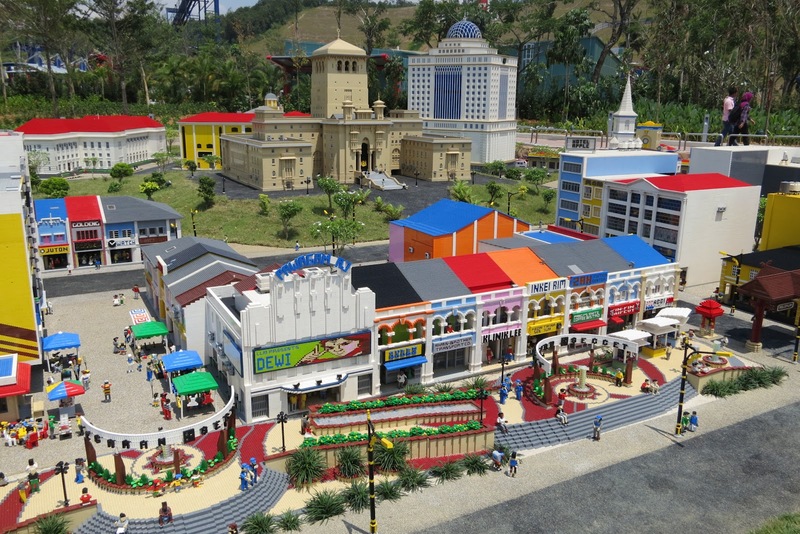 I’m glad that a new generation of children will be introduced to the world of Lego with the opening of Legoland Malaysia this September while many adults can fondly relive memories of their childhood spent in hours of creative fun, playing with Lego bricks. Visitors capturing a memento in a photo with Bricky! My reminiscing ended when I reached the ticket window and received my admission ticket. Armed with my ticket, I joined the queues again – this time to get my ticket scanned before entering the park. 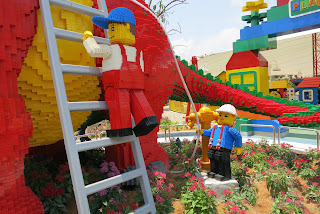 I made a beeline for the Guest Services Counter at The Beginning to ask for directions to the Media Center in the park and was pointed the right way with instructions to look for it behind Einstein in Lego Technic. Before finding that giant portrait of Albert Einstein sculptured in Lego bricks, situated between Lego Mindstorms and the Lego Academy, I was distracted by enthusiastic yells from riders enjoying their experiences on the Technic Twister and the Aquazone Wave Racers. 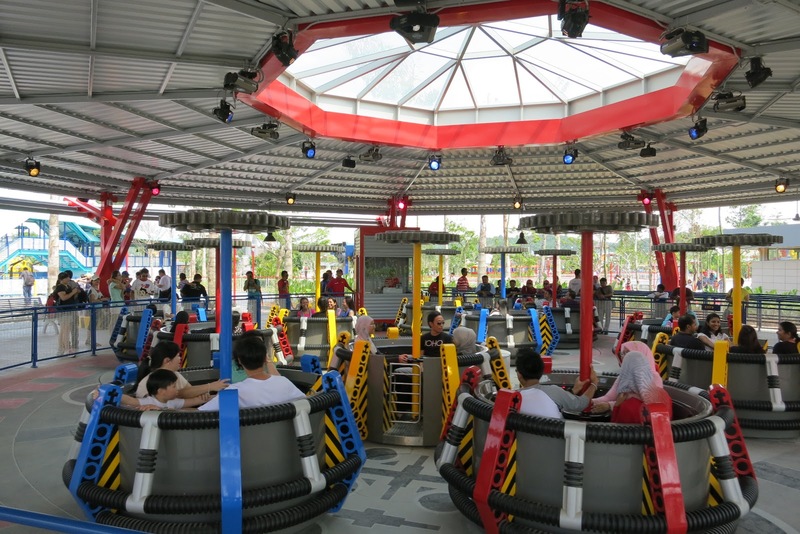 While I was watching them thrilling to spinning and splashing in their rides, my attention was suddenly riveted to shrieks above, coming from excited riders on the aerial tracks of Project X, the park’s fastest ride. When I finally found my way to the Media Center, I also met Siegfried Boerst, the park’s General Manager, who was being filmed for a TV show. Boerst is certainly upbeat about the opening of Legoland Malaysia, the sixth Legoland park in the world that joins five other Legoland parks located in Denmark, England, California, Germany and Florida. 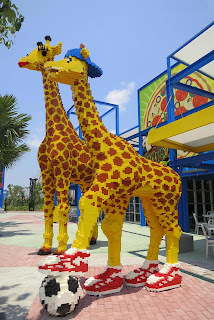 While all the rides, restaurants and attractions are opened in the park, construction is currently in progress on the adjacent Water Park (opening next year) and Legoland Hotel (opening 2014). 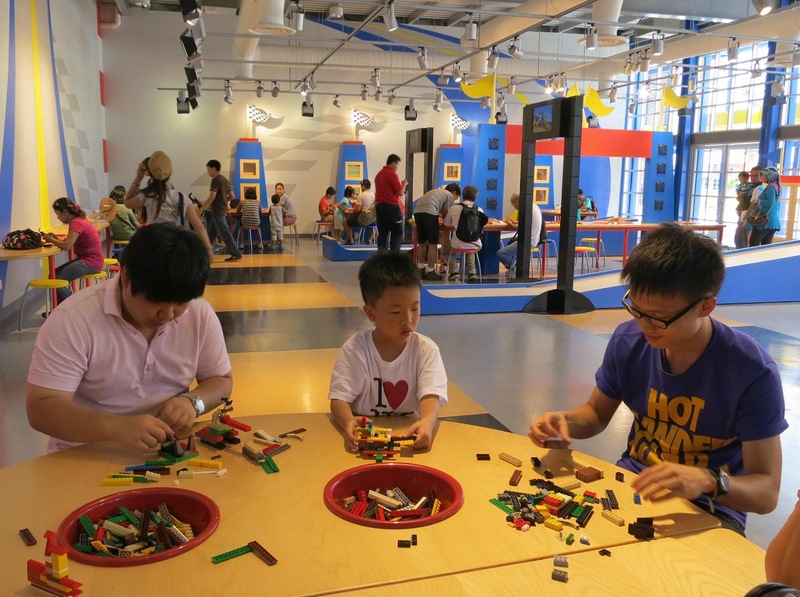 It’s interesting to learn that the 249 family rooms in the hotel are designed in Lego themes for guests to enjoy the Lego experience beyond their day in the park! 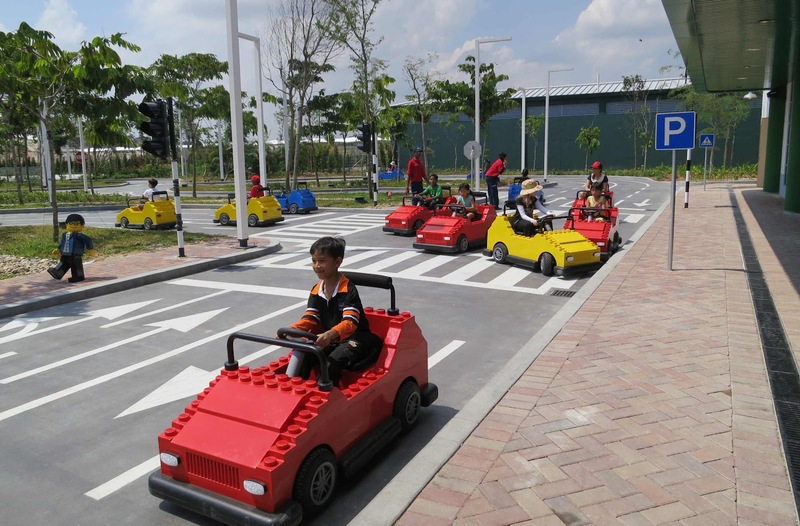 I explored the park and saw families with young children, teenagers and young adults enjoying endless fun with inter-active experiences in attractions that are designed to the highest international quality standards. While the park has lovely garden landscaping that included young saplings that will eventually become a canopy of trees, I just wished they would grow shady more quickly because my delicate skin was getting deep-fried even though I kept myself shaded from the scorching sun! and try to find that missing man! AkashA, probably one of the most hardworking Malaysian bands, performed their hundredth show on Sept 7, at the 9th Johor Baru Arts Festival. Fresh from the Colombo Music Arts Festival 2012 with shows from Aug 24 to 26 in Sri Lanka to a Merdeka Day show at Wawasan Open University in Penang, the indefatigable AkashA was unstoppable in Johor Baru for a one-night show jam-packed with fans. 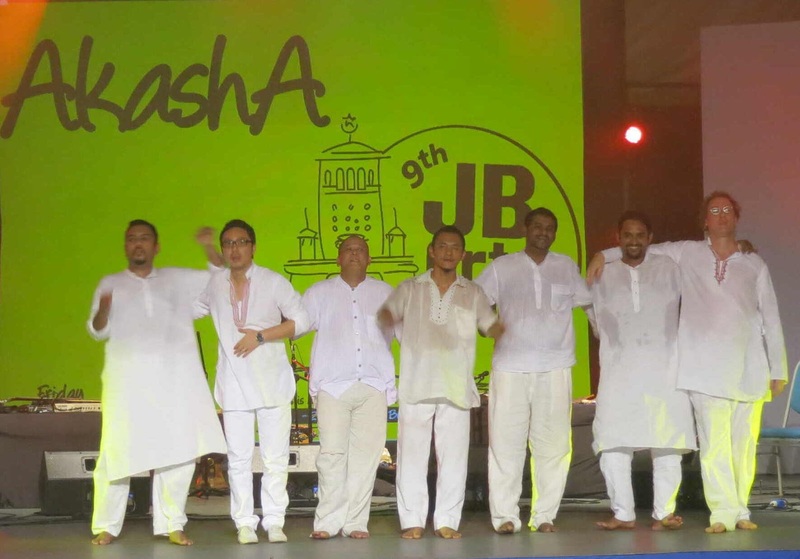 Being back in the JB Arts Fest for the third time says a great deal about the popularity of this all-Malaysian 7-piece band that first took the Rainforest World Music Festival by storm in 2008. The fusion music, that is the result of the members’ virtuosity on an eclectic assortment of musical instruments, has since captivated audiences throughout the region. 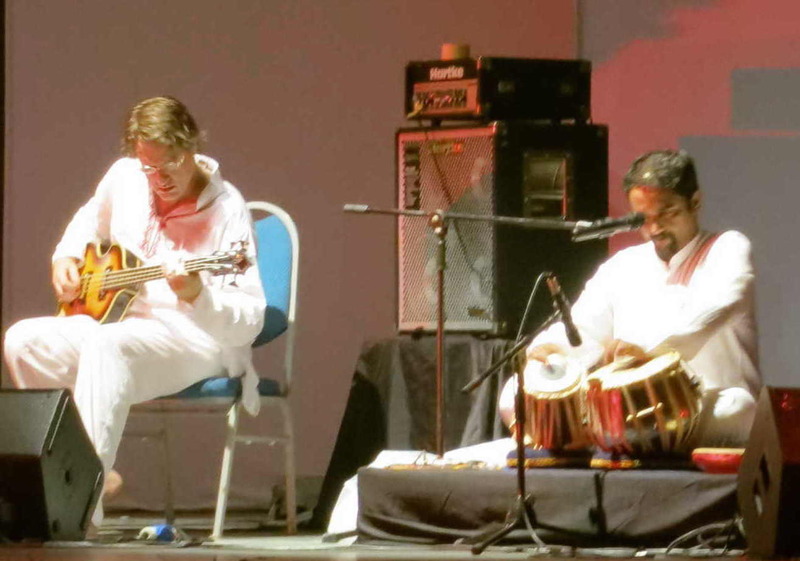 In JB, fans rocked, no less enthralled by their brand of music from various cultures with Sivabalan Sundram on mridangam (Indian drums), Kumar Kathigesu on sita, Vicknesh Ramakrishnan on tabla, Greg Henderson on bass guitar, Mohd Shah Nizam Azis on percussion and Eric Li on the keyboard. While the absence of acoustic guitarist and composer, Jamie Wilson, was conspicuous, fans welcomed his substitute Sallehuddin Arab, who also plays a mean guitar! 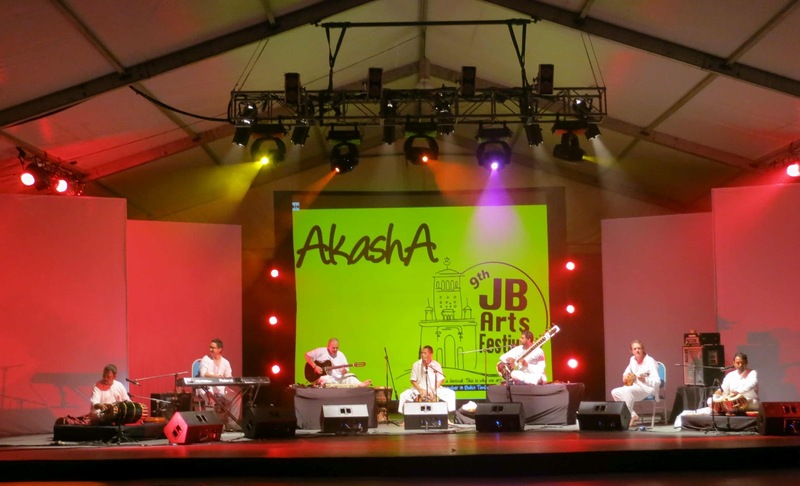 The raw appeal of AkashA’s brand of fusion music kept the audience in breathless awe and took them to a musical high as the acoustic guitar and sita exchanged impressive riffs and the djembe complemented with an exciting tempo. At the end of their final piece, the audience was reluctant to release them and cheerfully demanded for an encore – which the band graciously obliged. 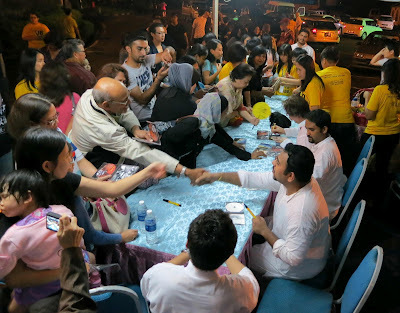 After the band took their well-deserved bow, band members met their fans and signed autographs on the CD covers of their music. While many were loyal fans who were pleased to be at AkashA’s 100th show, there were first-timers who became instant fans and went home happily with signed CDs of AkashA music. 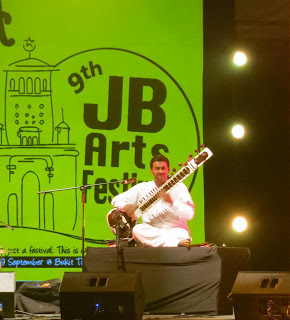 For more info, the calendar of free shows and tickets to shows in the 9th JB Arts Fest (till Sept 29), visit www.jbartsfest.com and the JB Arts Festival Facebook page.